Two minutes is a long time. Well, in certain situations it is anyway. Like standing at my local pedestrian crossing light. Two minutes there is a very long time indeed. Our main road is a very busy road. Cars whiz by in either direction in great quantities for eighteen hours of every day such that, if the lights weren’t there, you’d be hard-pressed to ever get across the bloody road at all. And this light used to be fast. Okay, I’ll admit it, it used to be too fast. The instant you pushed the little stainless steel button, the light would change. Not a second’s warning. Cars would grind to a shuddering halt or, as often as not, whiz through helplessly unable to react in time. It was actually quite satisfying. But somebody must have complained. …and, boy, do I feel the difference. Two minutes is a long time. You probably don’t think so, I wouldn’t blame you either. But try standing and doing absolutely nothing at all for two minutes. Try it in a cold place - no, try it in the rain. And, well, you know me. It is inevitable that I would think a bit while I am standing there. I tend to think about what all this means. As I often do, when I have too much time on my hands, I have started to compare my experiences at the newly-reset-pedestrian light with my overall life experiences and, valid or not, I have concluded that the pedestrian light is a microcosm of my current life. So, you know… brace yourself. The pedestrian light has effectively hobbled me. I can no longer move as fast or as freely as I want to. I am held-up and at the mercy of elements outside of my control. Meanwhile, I have to stand and watch others shooting past, fast, totally on-track, heading straight and unerringly for their destination. Sometimes the people look out at me as they rush along their way. I can see in their eyes that they would quite like to stop and let me across, to get me out of all this ‘standing in the rain’. But they can’t. If they even slow for me, the cars behind will simply careen into the back of them. They mustn’t stop, ‘cos, if they do, they might end up like me. Some don’t even stop when the light finally turns in my favour. That’s when anger falls on me and I shout my frustration at the injustice and inequality of it all. The people in the cars don’t understand my passion. All they did was nip through a red pedestrian light. Who are they hurting? Who, of any importance at all, would ever care? Yes, the light is showing me my life, how it has changed over the past three years, since the recession hit and the banks failed and we gave up our economic sovereignty to Europe. I won’t colour-in the comparisons, you’re not fools. I know you’ll get it. …and, as I stand, my only wish is that they’d speed my pedestrian light back up. Not back to being as fast as it was before. I don’t need that, just a tad quicker than it is now. I wish it would happen soon. Because I need to find myself a more up-beat analogy. I used to have no concept of patience when I was a kid. If the bus didn’t come within about 30 seconds of me arriving at a bus stop I’d start walking to the next one and usually ended up walking half way to where I was going when the bus finally arrived and I’d end up paying the same amount as I would have done had I waited for the damn thing to come where I was at the start. I used to have a saying – actually I still have the saying and here I am saying it – but it’s not something I believe these days: I know only three definitions of ‘patience’, a girl’s name, a game of cards and an opera by Gilbert and Sullivan – I know no other. I cannot believe how patient I have become as I’ve aged. With one significant exception: computers. When I first got a PC (an old 486, custom built with two floppy disk drives) I can remember just how long it took to download an image and now I expect to watch films streaming videos in high definition and if I type something into Google and I don’t get the answer I’m looking for in a fraction of a second I get annoyed because I’m working and I’m never going to get that second back: it’s gone, pfft! The simple fact is that I always have too many applications open at a single time and so what do I expect? I’ll tell you what I expect. I expect the thing to do what I want, when I want and I want it now. So I guess the old me is still in there somewhere. But other things I can wait months for and mostly when I get whatever it is that I’ve waited for I’m not that impressed. It takes a LOT to impress me these days. So I guess I’m not impatient to be disappointed. Disappointment is something worth waiting on. In fact if it never arrived I could live with that. Anyway, I had taken off for a retreat in the mountains and saw a standard mountain road warning sign. "Slow curves." I laughed so hard I nearly drove off the road. There it is. That's me. Nowhere near as profound or far-reaching as yours. But, well, sometimes one isn't. I just found your blog recently and I do enjoy your writing, sir. But clearly you're using those two minutes to good effect. 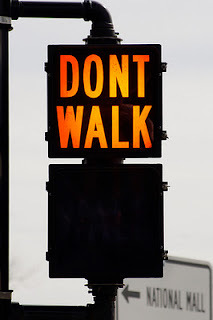 I don't know anyone else who could write an inspiring post about a pedestrian crossing but you've managed to do so! Where would the road take you if you didn't cross over? Could be a whole new opportunity to discover a load of places that you've never been to before!